Modern Machine Shop is focused on all aspects of metalworking technology - Providing the new product technologies; process solutions; supplier listings; business management; networking; and event information that companies need to be competitive. EVENTS | CONFERENCES | MEETINGS OCTOBER 5-9 PMPA National Technical Conference Rosemont, Illinois pmpa.org OCTOBER 10-11 Munich Technology Conference on Additive Manufacturing Munich, Germany oerlikon.com/mtc-event OCTOBER 10-12 MTForecast Indianapolis, Indiana mtforecast.com OCTOBER 16-18 In(3D)ustry Barcelona, Spain in3dustry.com OCTOBER 23-25 Parts2Clean Stuttgart, Germany parts2clean.de OCTOBER 23-26 EuroBlech 2018 Hannover, Germany euroblech.com OCTOBER 31 – NOVEMBER 1 Advanced Engineering UK Birmingham, United Kingdom thence.co.uk NOVEMBER 8 Discover Automation Ontario, Canada mazakusa.com NOVEMBER 8 Zoller Z.connect Workshop Ann Arbor, Michigan global.zoller.info FEBRUARY 26-28, 2019 Houstex 2019 Houston, Texas houstexonline.com MARCH 4-9, 2019 TIMTOS 2019 Taipei City, Taiwan timtos.com.tw APRIL 15, 2019 4th International Conference on Advances in 3D Printing & Modelling Amsterdam, Netherlands euro3dprinting.conference series.com MAY 21-24, 2019 Moulding Expo Stuttgart, Germany messe-stuttgart.de Greenleaf Corporation, 18695 Greenleaf Drive, PO Box 1040, Saegertown, PA 16433-1040, United States | +1 814 763 2915 | sales@greenleafcorporation.com For more information, visit: www.greenleafcorporation.com/xsytin-1 Greenleaf Corporation is ISO 9001 Certied. 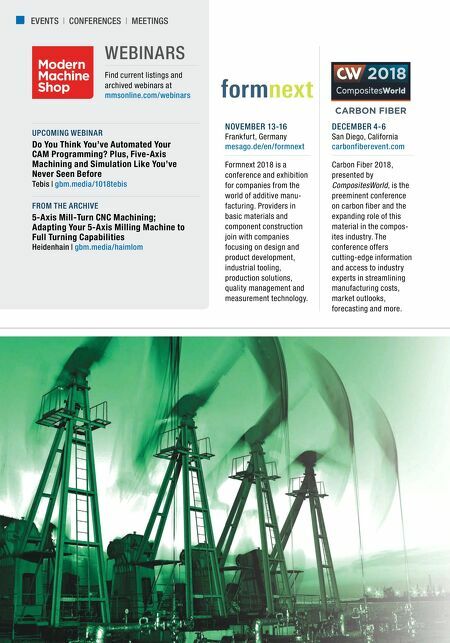 Refine your oil & gas machining. 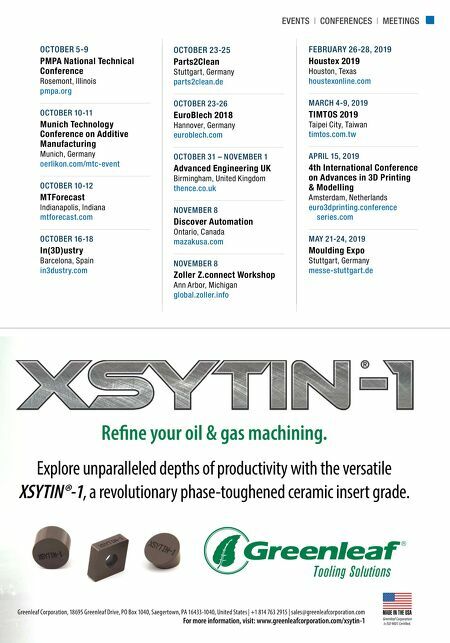 Explore unparalleled depths of productivity with the versatile XSYTIN®-1, a revolutionary phase-toughened ceramic insert grade.